There were lots of dogs to meet at Orphans of the Storm® this week, and they’re all ready and waiting to find their new forever home! 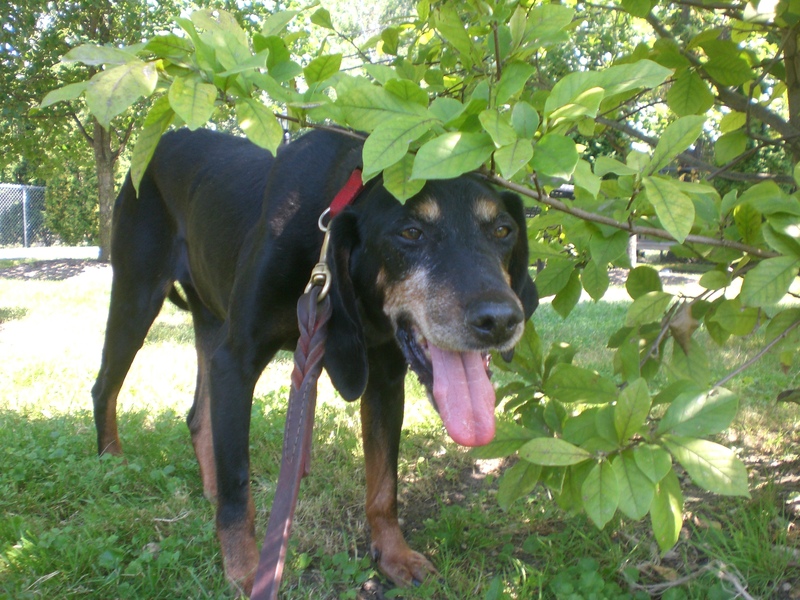 Granny the nine-year-old Coonhound mix is probably one of the sweetest, gentlest dogs I’ve met at Orphans of the Storm®. Since she’s an older lady, she’s not too interested in running around. 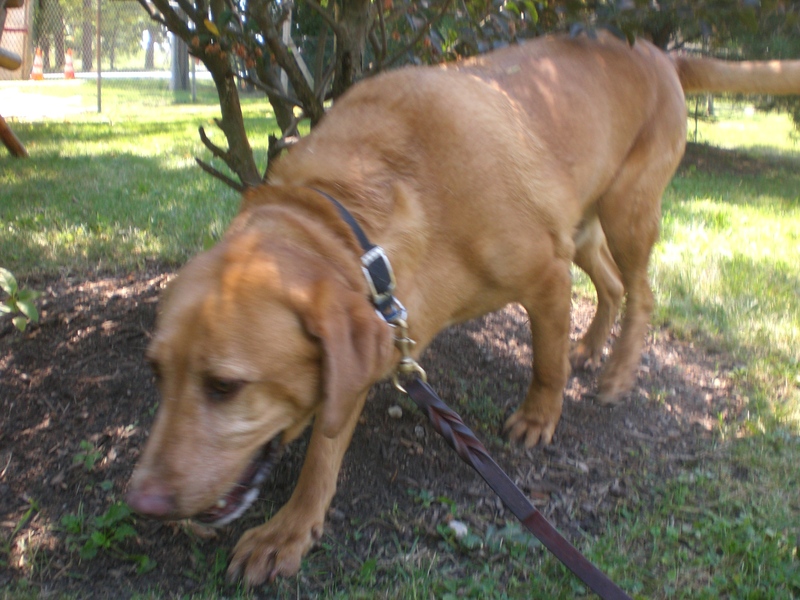 Instead, she prefers to go on casual strolls that allow her to put her Hound nose to good use. Granny makes for an easy-going walking companion because of this. Granny is also a very sweet girl. She may not cover you in doggy kisses (at least not until she knows you better), but she loves to sit close to you and get attention. Getting scratched under her chin seems to be a particular favorite. Don’t look past this sweetheart just because she’s a senior dog–one look into those big brown eyes and you’ll know that she still has lots of love to share! 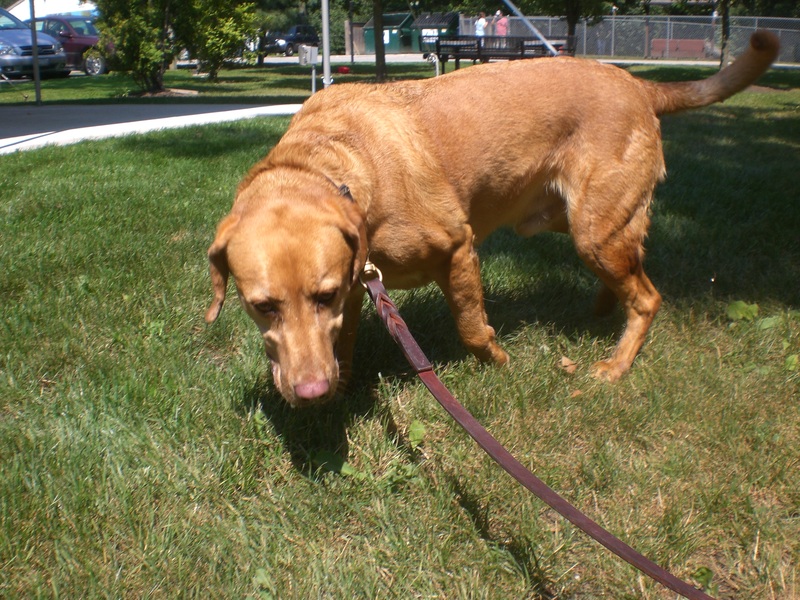 Jackson the three-year-old yellow Labrador Retriever mix is a big, strong boy with lots of energy. He was more of a take-charge kind of dog, leading the way on our walk. He was just so happy to be out and about! Jackson would love the opportunity to go for long walks and/or have a big yard to play in with his new family. Jackson eventually started to slow down a bit after we were out for a while, and came to stand next to me so I could give his ears and back a nice scratch. Jackson has that lovable Lab look, and we all know how popular Labs are, so he probably won’t be at the shelter for very long. 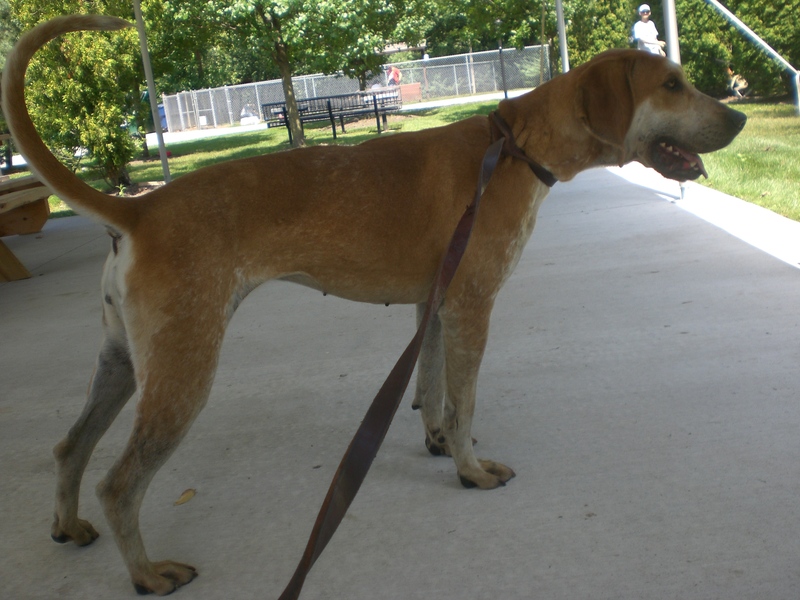 If you’re looking for a big, active dog, Jackson might be just the pooch for you! 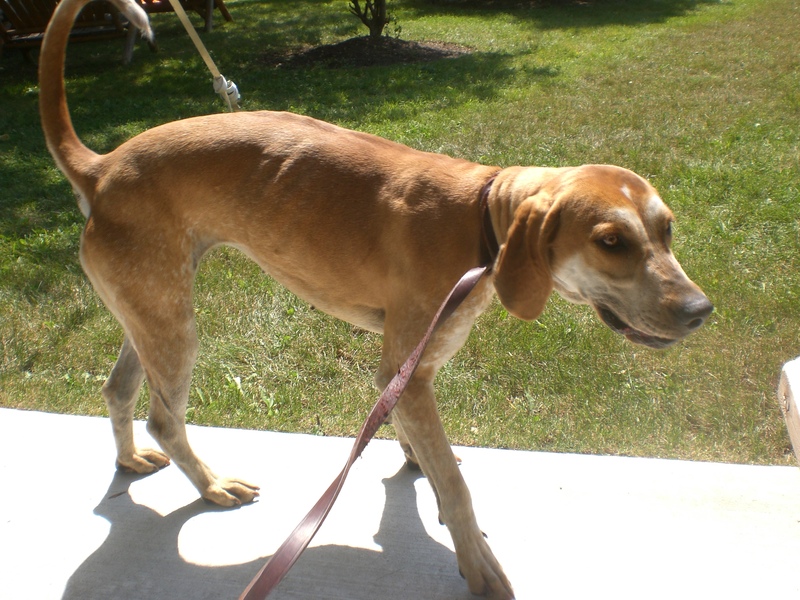 China the two-year-old Hound mix is much more playful than she would have you think from inside her kennel. China has actually been at Orphans of the Storm® for a couple of months, receiving heartworm treatment, but now she’s good to go! I always thought that she was an older dog because she was so calm and laid-back inside her kennel, but apparently she was just waiting for the chance to get out and run around. China has shared her kennel a couple of times with other dogs, and she was incredibly excited to see all of the other dogs who were out for walks and kept wanting to play with them, so she could absolutely go to a home with another dog. When she’s extra excited, she’ll even stand up on her back legs! China is also a snuggler. When I sat down on a shady bench after we had been out for a while, she hopped up next to me and gave me a big doggy kiss. Now that China is healthy, she can’t wait to spend the rest of her life in a happy home! I also spent some time with Rock, who I haven’t taken out for a while (but he is such a happy dog with that constantly wagging tail! ), and of course played with my buddies Molly and Reebok. For more information on these events, visit the Orphans of the Storm® Facebook page. 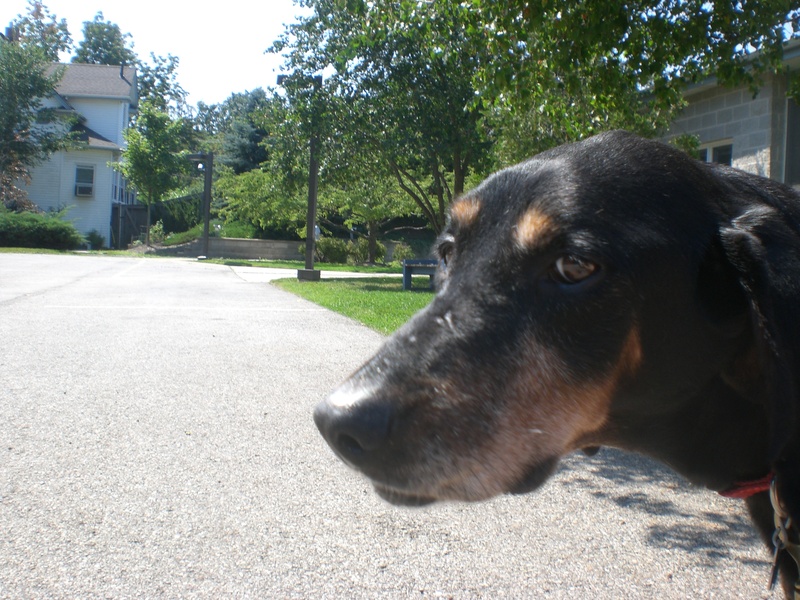 Posted by Meet the Pooches on August 29, 2013 in Dog Profiles and tagged adopt, adoption, animal shelter, animals, Chicago, Coonhound, dogs, Hound, Labrador Retriever, Orphans of the Storm, pets.